Avalon’s harbormaster, who was raised on Catalina, shares the highs and lows of harbor patrol duties and fond memories of growing up island-style. AVALON—Avalon’s harbormaster James “JJ” Poindexter has resided in Catalina Island’s only municipality since he was three days old. Poindexter was born to a Catalina-born mother in Nevada while his father was finishing up a construction job. Poindexter is one of the last of his kind who experienced and remembers his unique upbringing in Avalon, and who still lives there today. His father passed away in 1968 and his mother has also passed on in recent years. Poindexter’s sisters and son moved off the island. However, his wife and daughter still live with him in Avalon. Make no bones about it, Poindexter is committed to being of service to locals and visitors alike and has built quite a career as he rose through the ranks to harbormaster. Poindexter’s mother was born into a family who ran El Encanto restaurant for The Wrigleys. The island has seen many changes, just like anywhere else in the country, and the site where El Encanto once stood is now the upscale Island Spa Catalina. There is still an homage to El Encanto, however, as the spa operates Encanto Café. When Poindexter was growing up, Catalina was still a hot spot for celebrities and Poindexter met a couple of them. He mentions John Wayne, Ed MacMahon and Johnny Carson. Burl Ives used to play his guitar on his boat. Despite their celebrity status, they were normal decent people, Poindexter says. Poindexter fondly remembers his first job, which was diving for coins that steamship visitors would throw out. The younger kids started in the shallow waters and as a teenager, coin divers would begin diving in the deeper areas. This money gathered was not a lot, but it would afford Catalina’s youth the opportunity to see a movie or play at the arcade. Once a year, Poindexter’s mother would take him and his sisters to Long Beach to visit the shopping mall where they would shop and then take their haul back to Avalon. It’s common for island residents to take a suitcase to the Mainland, gather supplies and then return. A new Vons market, the first full-sized grocery store on the island, is coming in 2019 and Poindexter doesn’t get what all the controversy is about. “I know they [Safeway Corporation] can set the prices, but it’s got to be better to actually have aisles to walk down,” says Poindexter. Similar to Hawai’i, food and other goods have to be exported by ship or air and the price of say, a bottle of ketchup, is twice as much on Catalina as on the Mainland. As the founder of Avalon’s search and rescue team, Poindexter made it his life’s work to make a difference in people’s lives. After graduating from Avalon High School (Poindexter says, “If you blink, you’ll miss it! There’s only one school on Catalina Island.”), he pursued becoming a trained EMT. At city council meetings, it’s common to see him speaking on new training techniques, seeking out grants for new equipment and generally making sure Avalon keeps up with the latest technology. Poindexter explains a bond he’s made with folks the harbor patrol rescued, some who return to visit him when they can. Poindexter explains a philosophical belief system of how the world operates referring to “the highest of highs” and “the lowest of lows” in his years on patrol. The lowest of the lows came about recently. 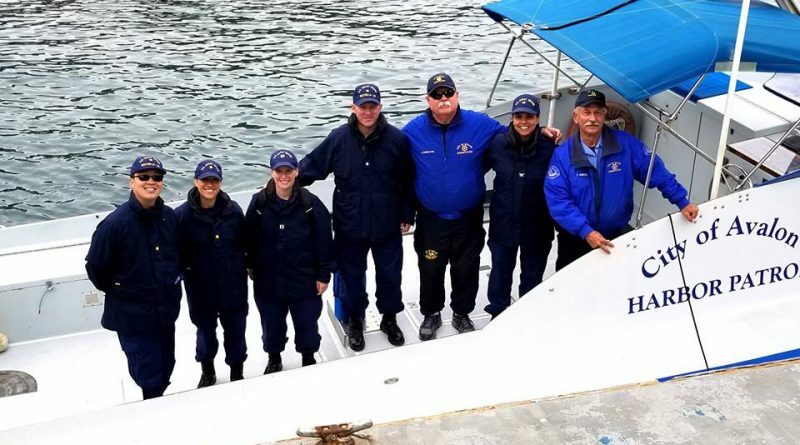 In 2014, the harbor patrol lost one of their own, a first in over 35 years of duty, according to Poindexter. Harbor patrol assistant Timothy Douglas Mitchell died near Green Pleasure Pier after only 7 months of service. Mitchell was killed while attempting to secure boats during a bad storm. Though Catalina is a beautiful place and a boating destination, Poindexter cannot stress the dangers of traveling there during the winter season while the Santa Ana wind conditions blow. Inexperienced boaters, and even those who have years of sailing under their belts, do not always realize how tumultuous winters can be in Avalon’s harbor. Poindexter also speaks of a trick that seems to work for knowing when weather will be less than ideal: If there’s snow on the mountains, it’s definitely not the time to plan a trip. Poindexter is himself as unique as his upbringing and has risen up through the ranks to harbormaster. He became harbormaster in July 2017 after his predecessor retired, which was surprising to many. Those who know Poindexter or have spoken with him are likely to know he peppers his conversation with sayings that really stick with you to sum up his experience. For instance, we turn to the subject of talks about Avalon City Council bringing back the harbor committee. Poindexter is generally optimistic about the council’s exploration of a new system, but mentions that during the 80s, the model had not worked. “It’s a little like putting the foxes in charge of the chicken coop, if you get what I mean,” says Poindexter, who still supports the city’s direction. The thinking behind harbor commissions is that business owners may be able to offer invaluable advice in how to run things, but sometimes, as with Avalon’s early incarnation of a harbor advisory board, that is not the case. Still, Poindexter has faith city staff could find a system that fits for residents and visitors. One of the challenges for Poindexter has been adapting to the political side of his position that take him away from being out on the water. In a climate where anything and everything you say can and will be held against you, Poindexter is careful not to offend and tries to veer clear of politicizing his viewpoints too much. Though change can bring sadness, Poindexter is anticipating the revitalization of the Cabrillo Mole, which is the main entryway for visitors coming to Avalon on the ferries and cruise ships. The transportation hub will be completed in two phases. Reprising the warning for bad weather, Poindexter wants boaters to stay safe during the holiday season. Luckily, he got his wish this year — boaters were more careful during the stormy season. “During New Years, keep your eye on the weather. It’s easier to stay at lodging than to set sail on rough waters. You’re just asking for trouble,” says Poindexter. Poindexter reminds boaters they can always call into harbor patrol to learn if conditions are reasonable before embarking on a weekend getaway to Avalon. Boaters can call in at 310-510-0535 or email harborpatrol@cityofavalon.com.